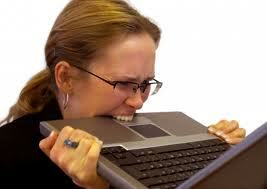 Stress at Work – Do you ever feel like this? Below are helpful tips to de-stress. Deep breathing. Take slow, long breathes in and out blowing out all the air from your lungs. Doing this repeatedly will help alleviate some of the stress your body is feeling and will ultimately help you relax and refocus your energy. Imagine that your stomach is a balloon and you really want to focus on filling up your balloon with as much air as possible. Then, slowly deflate your “balloon” and pull your belly button into your tail bone. Be comfortable. Pack one color scheme which will allow you to pack one pair of shoes and choose outfits that are business appropriate but that are also comfortable for traveling. Have and create the right mindset. Rather than stressing over situations outside of your control such as delayed fights, make the best out of it. View each part of your business trip as an adventure and you will get out of anything that comes your way. Eat healthy foods, stay hydrated, and get the blood flowing. Most business travelers do not have the time to get a long work out in before/after their meetings, etc. and sitting all day on the plane, in meetings, etc. does not allow for proper digestion. By drinking plenty of water and eating plenty of fruits and veggies, your body will be able to break down the food quicker giving you the much needed energy to get through the day. Also, be sure to take a walk outside, even if it is around the block, which will get the circulation flowing again and get you some much needed vitamin D from the sun’s rays. 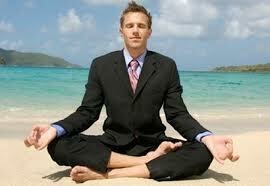 De-stress tactics – now this business traveler has the right idea!